Equipo Nizkor - CRS R41576 - Mexico: Organized Crime and Drug Trafficking Organizations. The notorious drug trafficking kingpin Joaquin "El Chapo" Guzmán is now imprisoned in the United States awaiting trial, following the Mexican government's decision to extradite him to the United States on January 19, 2017, the day before President Trump took office. Guzmán is charged with operating a continuing criminal enterprise and conducting drug-related crimes as the purported leader of the Mexican criminal syndicate commonly known as the Sinaloa cartel. The U.S. Drug Enforcement Administration (DEA) maintains that the Sinaloa cartel has the widest reach into U.S. cities of any transnational criminal organization. 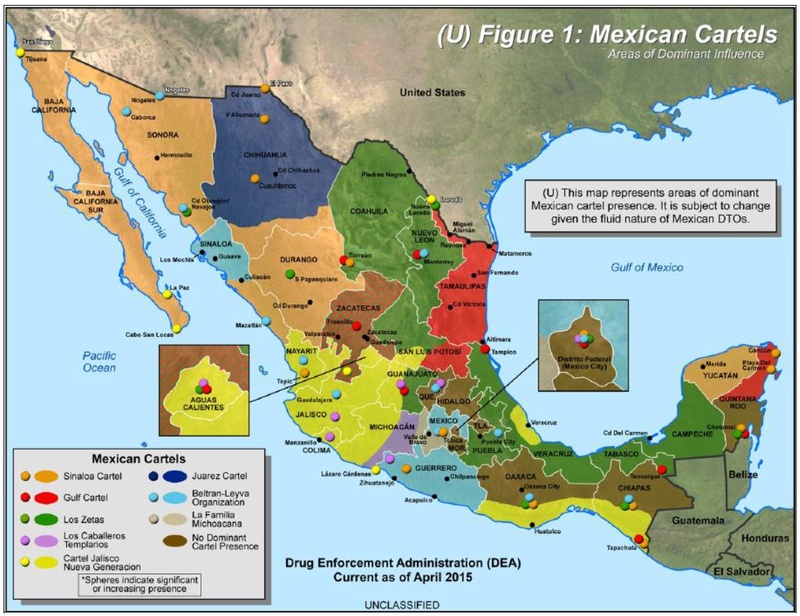 In November 2016, in its National Drug Threat Assessment, the DEA stated that Mexican drug trafficking groups are working to expand their presence, particularly in the heroin markets inside the United States. Over the years, Mexico's criminal groups have trafficked heroin, methamphetamine, cocaine, marijuana, and increasingly the powerful synthetic opioid fentanyl. Mexico's drug trafficking organizations (DTOs) have been in constant flux. By some accounts, in 2006, there were four dominant DTOs: the Tijuana/Arellano Felix organization (AFO), the Sinaloa cartel, the Juarez/Vicente Carillo Fuentes organization (CFO), and the Gulf cartel. Since then, the more stable large organizations have fractured. In recent years, the DEA has identified the following organizations as dominant: Sinaloa, Los Zetas, Tijuana/AFO, Juarez/CFO, Beltran Leyva, Gulf, and La Familia Michoacana. In some sense, these organizations might be viewed as the "traditional" DTOs, although the 7 organizations appear to have fragmented to at least 9 (or as many as 20) major organizations. New crime groups have emerged since the December 2012 inauguration of Mexican President Enrique Pena Nieto, who has faced an increasingly complex crime situation. The major DTOs and new crime groups have furthered their expansion into such illicit activity as extortion, kidnapping for ransom, and oil syphoning, posing a governance challenge to President Pena Nieto as daunting as that faced by his predecessors. Former Mexican President Felipe Calderón (2006-2012) initiated an aggressive campaign against Mexico's drug traffickers that was a defining policy of his government and one that the DTOs violently resisted. Operations to eliminate DTO leaders sparked organizational change, which led to significant instability among the groups and continued violence. Such violence appears to be rising again in Mexico. In January 2017, the country registered more homicides than in any January since the government began to release national crime data in the late 1980s. In a single weekend in April 2017, more than 35 died in what was assumed to be drug trafficking-related violence. Although the Mexican government no longer estimates organized crime-related homicides, some independent analysts have claimed that murders linked to organized crime may have exceeded 100,000 since 2006, when President Calderón began his campaign against the DTOs. Mexico's government reported that the annual number of all homicides in Mexico declined after Calderón left office in 2012 by about 16% in 2013 and 15% in 2014, only to rise in 2015 and 2016. In 2016, the Mexican government reported a 22% increase in all homicides to 22,932, almost reaching the high point of nearly 23,000 murders in 2011, Mexico's most violent year. The 115th Congress remains concerned about security conditions inside Mexico and the illicit drug trade. The Mexican DTOs are the major wholesalers of illegal drugs in the United States and are increasingly gaining control of U.S. retail-level distribution. This report examines how the organized crime landscape has been significantly altered by fragmentation and how the organizational shape-shifting continues. For more background, see CRS Report R41349, U.S. Mexican Security Cooperation: The Mérida Initiative and Beyond, and CRS In Focus IF10400, Heroin Production in Mexico and U.S. Policy. Mexico's stability is of critical importance to the United States, and the nature and intensity of violence in Mexico has been of particular concern to the U.S. Congress. Mexico shares a nearly 2,000-mile border with the United States, and the two countries have close trade, cultural, and demographic ties. In addition to U.S. concern about this strategic partner and close neighbor, policymakers have expressed concern that the violence in Mexico could "spill over" into U.S. border states (or further inland) despite beefed-up security measures. Although that concern seems to have declined somewhat, the appearance of large mass graves in March 2017 in the Mexican state of Veracruz, including one holding the remains of 250 victims, has turned attention back to the violent landscape facing some Mexican citizens, especially in parts of the country used to produce and traffic drugs. In March 2017, three journalists were killed, with at least two of the three clearly identified with covering the crime beat or government corruption. Mexico's brutal drug trafficking-related violence has been dramatically punctuated by beheadings, public hanging of corpses, car bombs, and murders of dozens of journalists and government officials. Beyond these brazen crimes, violence has spread from the border with the United States to Mexico's interior, flaring in the Pacific states of Michoacan and Guerrero in recent years, in the border state of Tamaulipas, and in Chihuahua and Baja California, where Mexico's largest border-region cities of Tijuana and Juarez are located and where violence spiked between 2009 and 2011 to war-zone levels. Organized crime groups have splintered and diversified their crime activities, turning to extortion, kidnapping, auto theft, human smuggling, retail drug sales, and other illicit enterprises. These crimes often are described as more "parasitic" for local populations inside Mexico. Estimates of Mexico's disappeared or missing also have raised concerns as unmarked graves are uncovered. Addressing the question of whether violence (as measured by the number of intentional homicides) is again on the rise, the Justice in Mexico project at the University of San Diego reports that total homicides in Mexico increased by 7% between 2014 and 2015. |1| Mexico's National Public Security System reported that total homicides increased by 22% in 2016 over the totals for 2015, rising to close to 23,000 intentional homicides. In 2016, 25 of Mexico's 31 states saw increases in homicides. |2| In addition, several analysts have raised concerns about severe human rights violations involving Mexican military and police forces, which have at times colluded with Mexico's criminal groups. Due to casualty estimates being reported differently by the Mexican government than by the media outlets that track the violence, some debate exists on exactly how many have perished. |3| This report conveys government data, but the data have not consistently been reported promptly or completely. For example, the government of President Felipe Calderón released tallies of "organized-crime related" homicides through September 2011. For a time, President Enrique Pena Nieto's Administration also issued such estimates, but it stopped in mid-2013. Although precise tallies diverged, the trend during President Calderon's tenure was a sharp increase in the number of homicides related to organized crime through 2011, when the number started a slight decline before Calderón left office in late 2012. Of total intentional homicides since 2006, many analysts maintain that 80,000-100,000 were organized crime-related killings. President Calderón made an aggressive campaign against crime groups, especially the large drug trafficking organizations (DTOs), the central focus of his Administration's policy. He sent several thousand Mexican military troops and federal police to combat the organizations in drug trafficking "hot spots" around the country. His government made some dramatic and well-publicized arrests, but few of those captured kingpins were effectively prosecuted. Between 2007 and 2012, as part of much closer U.S.-Mexican security cooperation, the Mexican government significantly increased extraditions to the United States, with majority of the suspects wanted by the U.S. government on drug trafficking and related charges. The number of extraditions peaked in 2012 and has declined somewhat since President Peña Nieto took office. |8| Another result of this "militarized" strategy was an increase in accusations of human rights violations against the Mexican military, which was largely untrained in domestic policing. When President Peña Nieto took office in December 2012, he had indicated he would take a new direction in his security policy: more focused on reducing criminal violence that affects civilians and businesses and less oriented toward removing the leadership of the large DTOs. His then attorney general, Jesus Murillo Karam, said in 2012 that Mexico faced challenges from some 60 to 80 crime groups operating in the country whose proliferation he attributed to the Calderón government's kingpin strategy. |9| However, despite Peña Nieto's stated commitment to shift the focus of the government's strategy, analysts have noted a significant continuity between his and Calderon's security approaches. |10| The Peña Nieto government has continued the military and federal police deployments used by the Calderón government to combat the DTOs, but it has recentralized control over security in Mexico's interior ministry. In 2014, the Peña Nieto Administration implemented another security strategy element promised during his presidential campaign: standing up a national militarized police force, or gendarmarie. The scope of the force implemented in August 2014 was significantly scaled back from its original proposed size of 40,000 to 5,000 officers who were added to the federal police force. The new force had the mission of protecting citizens from crime and shielding their economic and industrial activities from harm, such as defending vital petroleum infrastructure. Some observers maintain that the gendarmerie's distinct purpose has not been clarified or followed. President Peña Nieto's focus on the prevention of crime, also launched with significant emphasis early in his six-year term, has been scaled back and recently cut due to low oil prices, which stifled economic growth and caused the government to impose significant budget austerity measures. For more than a decade, Members of Congress convened numerous hearings dealing with the violence in Mexico, U.S. foreign assistance, and border security issues. Congressional concern heightened after U.S. consulate staff and security personnel working in Mexico came under attack, with some killed or wounded, allegedly with corrupt police support. |14| Following a 2010 car bombing allegedly set by a drug trafficking organization in Ciudad Juárez, Chihuahua (killing four), additional car bombs attributed to the DTOs have been exploded in border states and elsewhere. Occasional use of car bombs, grenades, and rocket-propelled grenade launchers–such as the one used to bring down a Mexican army helicopter in May 2015–continue to raise concerns that some Mexican drug traffickers may be adopting insurgent or terrorist techniques. Congress has expressed concern over the violence and sought to provide oversight on U.S.Mexican security cooperation. The 115th Congress is likely to continue to evaluate how the Mexican government is combating the illicit drug trade, working to reduce related violence, and tracking the effects of drug trafficking and violence challenges on the security of both the United States and Mexico. Going forward, some uncertainty has arisen due to tensions between the Trump Administration and the Mexican government regarding other aspects of the U.S.-Mexican relationship. The splintering of the large DTOs into competing factions and gangs of different sizes took place over several years. The development of these different crime groups, ranging in scope from transnational criminal organizations to small local mafias with certain trafficking or other crime specialties, has made the crime situation even more diffuse and the groups' criminal behavior harder to eradicate, according to some observers. The large DTOs, which tended to be hierarchical, often bound by familial ties, and led by hard-to-capture cartel kingpins, have been replaced by flatter, more nimble organizations that tend to be loosely networked. Far more common in the present crime group formation is the outsourcing of certain aspects of trafficking. The various smaller organizations resist the imposition of norms to limit violence. The growth of rivalries among a greater number of organized crime "players" has produced continued violence, albeit in some cases these players are "less able to threaten the state and less endowed with impunity." |15| However, even the larger organizations (Sinaloa, for example) that have adopted a cellular structure still may attempt to protect their leadership, as in the 2015 escape orchestrated for the world's most-wanted drug kingpin, "El Chapo" Guzmán, through a mile-long tunnel from a maximum-security prison. Drug trafficking organizations have operated in Mexico for more than a century. The DTOs can be described as global businesses with forward and backward linkages for managing supply and distribution in many countries. As businesses, they are concerned with bringing their product to market in the most efficient way to maximize their profits. The Mexican DTOs are the major wholesalers of illegal drugs in the United States and are increasingly gaining control of U.S. retail-level distribution through alliances with U.S. gangs. Their operations, however, are markedly less violent in the United States than in Mexico, despite their reported presence in multiple U.S. jurisdictions. |20| The DTOs use the tools of bribery and violence, which are complementary. Violence is used to discipline employees, enforce transactions, limit the entry of competitors, and coerce. Bribery and corruption help to neutralize government action against the DTOs, ensure impunity, and facilitate smooth operations. The proceeds of drug sales (either laundered or as cash smuggled back to Mexico) are used in part to corrupt U.S. and Mexican border officials, |21| Mexican law enforcement, security forces, and public officials either to ignore DTO activities or to actively support and protect DTOs. Mexican DTOs advance their operations through widespread corruption; when corruption fails to achieve cooperation and acquiescence, violence is the ready alternative. Arrests of police and other public officials accused of cooperating with the drug trafficking organizations (DTOs) rarely have been followed by convictions, although a few prominent cases involving official corruption have achieved results. In January 2015, the government reported that more than 90 people were detained and charged for their alleged involvement in the Iguala student disappearances case in Guerrero in late 2014. |23| In May 2015, Iguala's deputy police chief was arrested and identified as a mastermind of the decision to turn the students over to the drug cartel that the government originally alleged had incinerated the students' bodies. |24| In 2016, the Iguala police chief, who had been in hiding since 2014, was arrested. The system's stability began to fray in the 1990s as Mexican political power decentralized and the push toward democratic pluralism began, first at the local level and then nationally with the election of the National Action Party (PAN) candidate, Vicente Fox, as president in 2000. |29| The process of democratization upended the equilibrium that had developed between state actors (such as the Federal Security Directorate, which oversaw domestic security from 1947 to 1985) and organized crime. No longer were certain officials able to ensure the impunity of drug traffickers to the same degree and to regulate competition among Mexican DTOs for drug trafficking routes, or plazas. To a large extent, DTO violence directed at the government appears to be an attempt to reestablish impunity, while the inter-cartel violence seems to be an attempt to reestablish dominance over specific drug trafficking plazas. The intra-DTO violence (or violence inside the organizations) reflects a reaction to suspected betrayals and the competition to succeed killed or arrested leaders. Today, the major Mexican DTOs are polydrug, handling more than one type of drug, although they may specialize in the production or trafficking of specific products. According to the U.S State Department's International Narcotics Control Strategy Report (INCSR) covering 2016, Mexico is a major producer of heroin, marijuana, and methamphetamine destined for the United States. It is also the main trafficking route for U.S.-bound cocaine from the major supply countries of Colombia, Peru, and Bolivia. |30| The west coast state of Sinaloa, which has a long coastline and difficult-to-access areas favorable for drug cultivation, is the heartland of Mexico's drug trade. Marijuana and poppy cultivation has flourished in this state for decades. |31| It has been the source of Mexico's most notorious and successful drug traffickers. In the INCSR published in March 2017, the U.S. State Department reports coca bush cultivation and cocaine production in Colombia has risen sharply, with the U.S. government estimating for 2016 that Colombia produced 710 metric tons of pure cocaine. Cocaine of Colombian origin supplies about 90% of the U.S. market, and most of it is trafficked through Mexico. In 2015, according to the National Drug Threat Assessment, Mexico produced about 80% of the heroin seized in the United States, and Mexico has become a producer of a potent synthetic opioid, fentanyl, which can be up to 50 times stronger than heroin. |32| The Mexican government eradicates both opium poppy (from which heroin is derived) and cannabis, and it increased its eradication efforts of both plant-based drugs in 2016. According to the INCSR, Mexico seized 26.5 metric tons of methamphetamine and 10.2 metric tons of cocaine from April 2014 to September 2015. In addition, Mexican authorities seized 272 clandestine drug laboratories. The DTOs have been in constant flux in recent years. |33| By some accounts, when President Calderón came to office in December 2006, there were four dominant DTOs: the Tijuana/Arellano Felix organization (AFO), the Sinaloa cartel, the Juarez/Vicente Carillo Fuentes organization (CFO), and the Gulf cartel. Since then, the more stable large organizations that existed in the earlier years of the Calderón Administration have fractured into many more groups. For several years, the U.S. Drug Enforcement Administration (DEA) identified the following organizations as dominant: Sinaloa, Los Zetas, Tijuana/AFO, Juarez/CFO, Beltran Leyva, Gulf, and La Familia Michoacana. In some sense these might be viewed as the "traditional" DTOs. However, many analysts suggest that those 7 groups now seem to have fragmented to between 9 and as many as 20 major organizations. Today, fragmentation, or "balkanization," of the major crime groups has been accompanied by many groups' diversification into other types of criminal activity. The following section will focus on nine DTOs whose current status illuminates the great fluidity of all the DTOs in Mexico as they face new challenges from competition and changing market dynamics. Reconfiguration of the major DTOs–often called transnational criminal organizations, or TCOs, due to their diversification into other criminal businesses–preceded the fragmentation that is so rampant today. 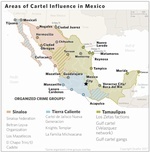 The Gulf cartel, based in northeastern Mexico, had a long history of dominance in terms of power and profits, with the zenith of its power in the early 2000s. However, the Gulf cartel's enforcers–Los Zetas, who were organized from highly trained Mexican military deserters–split to form a separate DTO and turned against their former employers, engaging in a hyper-violent competition for territory. Sinaloa survived the arrest of its billionaire founder Joaquin "El Chapo" Guzmán in 2014. The federal operation to capture and detain Guzmán, which gained support from U.S. intelligence, was viewed as a major victory for the Peña Nieto government. Somewhat surprisingly, the legendary kingpin's arrest did not spawn a visible power struggle within the cartel's hierarchy, as many observers had anticipated. His escape in July 2015 followed by his rearrest in January 2016, however, raised speculation that his role in the Sinaloa cartel might have become more as a figurehead than functional leader. Notes: DEA uses the term "cartel" in place of drug trafficking organization (DTO). The Knights Templar, discussed in the text of the report, is labeled in Spanish as Los Caballeros Templarios. The AFO was once one of the two dominant DTOs in Mexico, infamous for brutally controlling the drug trade in Tijuana in the 1990s and early 2000s. |39| The other was the Juarez DTO, also known as the Carrillo Fuentes Organization. The Mexican government and U.S. authorities took vigorous enforcement action against the AFO in the early years of the 2000s, with the arrests and killings of the five brothers involved in the drug trade–the last of whom was captured in 2008. In 2008, Tijuana became one of the most violent cities in Mexico. That year, the AFO split into two competing factions when Eduardo Teodoro "El Teo" Garcia Simental, an AFO lieutenant, broke from Fernando "El Ingeniero" Sanchez Arellano (the nephew of the Arellano Felix brothers who had taken over the management of the DTO). Garcia Simental formed another faction of the AFO, reportedly allied with the Sinaloa DTO. |40| Further contributing to the escalation in violence, other DTOs sought to gain control of the profitable Tijuana/Baja California-San Diego/California plaza in the wake of the power vacuum left by the earlier arrests of the AFO's key players. Some observers believe that the 2010 arrest of Garcia Simental created a vacuum for the Sinaloa DTO to gain control of the Tijuana/San Diego smuggling corridor. |41| Despite its weakened state, the AFO appears to have maintained control of the plaza through an agreement made between Sanchez Arellano and the Sinaloa DTO's leadership, in which Sinaloa and other trafficking groups pay a fee to use the plaza. |42| Some analysts credit the relative peace in Tijuana as a law enforcement success, but it is unclear how large of a role policing strategy has played. Sinaloa, described as Mexico's oldest and most established DTO, is comprised of a network of smaller organizations. By some estimates, it had grown to control 40%-60% of the country's drug trade by 2012. |46| Some estimates place Sinaloa's annual earnings at around $3 billion. |47| Sinaloa reportedly has a substantial presence in some 50 countries, including throughout the Americas, Europe, West Africa, and Southeast Asia. The Sinaloa DTO controls crime in at least five Mexican states–Baja California; Sonora; and the "Golden Triangle" of Sinaloa, Durango, and Chihuahua–but it has been challenged in 2016 and early 2017 in some of those states. The DEA has noted Sinaloa's dominance on Mexico's west coast and its primary use of crossing points into the United States for drugs, including heroin, in California, Arizona, New Mexico, and West Texas. The DTO appeared to weather Guzmán's arrest without the spike in internal violence that is often associated with arrests of other DTO kingpins. |51| Although Sinaloa appeared to have retained its internal cohesion, Mexican media sources reported that the level of organized-crime related homicides in Sinaloa state did slightly increase after Guzmán's arrest. With the rumored death in June 2014 of Juan Jose "El Azul" Esparragoza Moreno, one of Guzmán's most trusted deputies, the head of the Sinaloa DTO was assumed to be Guzmán's partner, Ismael Zambada Garcia, alias "El Mayo." |52| Although less is known about an apparent successor, Dámaso López Núñez, aka "El Licenciado," with the extradition to the United States of Guzmán in January 2017 some analysts consider the era of El Chapo to be over. The shape of the cartel in the new era or within Mexico's criminal landscape is evolving. Based in the border city of Ciudad Juárez in the central northern state of Chihuahua, the once-powerful Juarez DTO controlled the smuggling corridor between Ciudad Juarez and El Paso, TX, in the 1980s and 1990s. |60| By some accounts, the Juarez DTO controlled at least half of all Mexican narcotics trafficking under the leadership of its founder, Amado Carrillo Fuentes. Vicente Carrillo Fuentes, Amado's brother, took over the leadership of the cartel when Amado died during plastic surgery in 1997 and reportedly led the Juarez organization until his arrest in October 2014. Other analysts credit the Sinaloa DTO with success in its battle over the Juarez DTO after 2012. They consider the Sinaloa's dominance, perhaps abetted by local authorities, to be the reason for the relatively peaceful and unchallenged control of the border city despite the Juarez DTO's continued presence in the state of Chihuahua. |66| Many residents who fled during the years of intense drug-related violence remain reluctant to return to Juarez and cite the stubbornly elevated homicide rate as one reason. |67| Traditionally a major trafficker of both marijuana and South American cocaine, the Juarez cartel has become active in opium cultivation and heroin production, according to the DEA. Violence rose in 2016 to levels not seen since 2012, suggesting control of the trafficking route across the border to Texas is again in flux. Based in the border city of Matamoros, Tamaulipas, with operations in other Mexican states on the Gulf side of Mexico, the Gulf DTO is a transnational smuggling operation with agents in Central and South America. |68| The Gulf DTO was the main competitor challenging Sinaloa for trafficking routes in the early 2000s, but it now battles its former enforcement wing, Los Zetas, over territory in northeastern Mexico. The Gulf DTO reportedly has split into several competing gangs. From 2014 through 2016, some media sources outside of the state of Tamaulipas and anonymous social media accounts from within Tamaulipas reported daily kidnappings, daytime shootings, and burned-down bars and restaurants in towns and cities such as the port city of Tampico. Like the Zetas, fragmented cells of the Gulf DTO have expanded into other criminal operations, such as fuel theft and widespread extortion. One theory is that the Gulf DTO is poised to make a return to coherence following the decimation of Los Zetas and that Gulf will reconstitute and attempt to wrestle control of the strategically significant city of Monterrey in the neighboring state of Nuevo Leon. 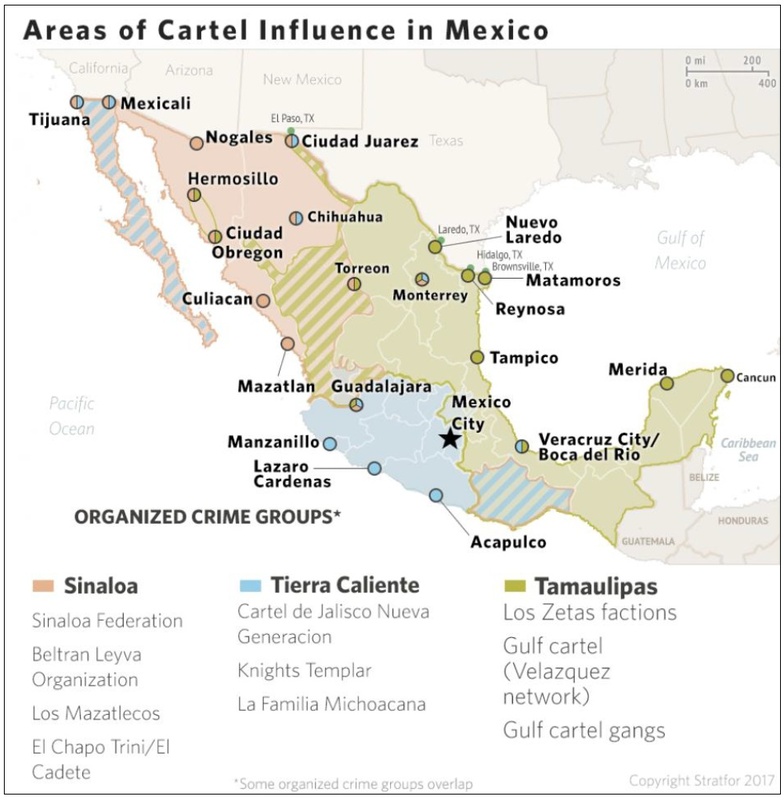 |75| Other theories are that the Gulf DTO is now so fragmented and internally divided into factions itself that it is best understood–as are the Zetas–as part of a "regional crime umbrella" in Tamaulipas (see Figure 3). 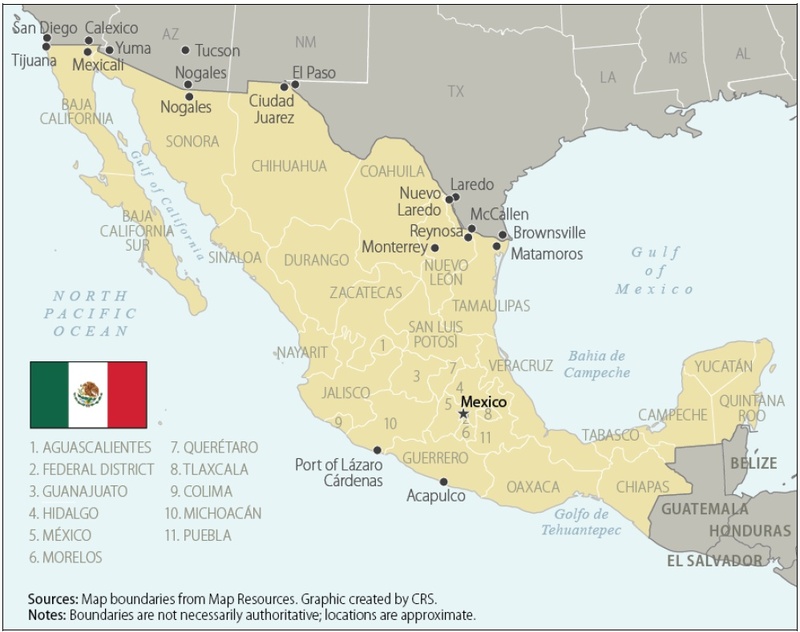 Los Zetas manage a significant presence in several Mexican states on the Gulf (eastern) side of the country, have extended their reach to Ciudad Juarez (Chihuahua) and some Pacific states, and operate in Central and South America. More aggressive than other groups, Los Zetas appear to use intimidation as a strategy to maintain control of territory, making use of social media and public displays of bodies and body parts to send messages to frighten Mexican security forces, the local citizenry, and rival organizations. Sometimes smaller gangs and organizations use the "Zeta" name to tap into the benefits of the Zeta reputation or "brand." Los Zetas are known for their diversification and expansion into other criminal activities, such as fuel theft, extortion, kidnapping, human smuggling, and arms trafficking. According to media coverage, Pemex, Mexico's state oil company, announced that it lost more than $1.15 billion in 2014 due to oil tapping. In early 2017, the Atlantic Council released a report estimating that about $1 billion of oil revenue is lost annually in Mexico, with Los Zetas controlling about 40% of the market in stolen oil. Los Zetas resisted government attempts to curtail their sophisticated networks for the oil and gas that they stole. |82| Most incidents of illegal siphoning occur in the Mexican Gulf states of Tamaulipas and Veracruz. Some analysts maintain that the Mexican government critically weakened Los Zetas but unintentionally caused the "balkanization" of the group into independent cells due to these internal splits. They argue that the organization used a franchise principle to reformulate itself to adjust to crisis. Although many dispute the scope of the territory held by Los Zetas and the formerly cohesive group's immediate prospects, most concur that the organization is no longer as powerful as it was during the height of its dominance in 2011 and 2012. Before 2008, BLO was part of the Sinaloa federation and controlled access to the U.S. border in Mexico's Sonora state. The Beltrán Leyva brothers developed close ties with Sinaloa head Joaquin "El Chapo" Guzmán and his family, along with other Sinaloa-based top leadership. The January 2008 arrest of BLO's leader, Alfredo Beltrán Leyva, through intelligence reportedly provided by Guzmán, triggered BLO's split from the Sinaloa DTO. |83| The two organizations have remained bitter rivals since. The organization suffered a series of setbacks at the hands of the Mexican security forces, beginning with the December 2009 killing of Arturo Beltrán Leyva, followed closely by the arrest of Carlos Beltran Levya. In 2010, the organization broke up when the remaining brother, Hector Beltran Leyva, took the remnants of BLO and rebranded it as the South Pacific (Pacifico Sur) cartel. Another top lieutenant, Edgar "La Barbie" Valdez Villarreal, took a faction loyal to him and formed the Independent Cartel of Acapulco, which he led until his arrest in 2010. |84| The South Pacific cartel appeared to retake the name Beltran Leyva Organization and achieved renewed prominence under Hector Beltran Leyva's leadership, until his arrest in October 2014. Based originally in the Pacific state of Michoacán, LFM traces its roots back to the 1980s. Formerly aligned with Los Zetas before the group's split from the Gulf DTO, LFM announced its intent to operate independently from Los Zetas in 2006, declaring that LFM's mission was to protect Michoacán from drug traffickers, including its new enemies, Los Zetas. |89| From 2006 to 2010, LFM acquired notoriety for its use of extreme, symbolic violence, military tactics gleaned from the Zetas, and a pseudo-ideological or religious justification for its existence. |90| LFM members reportedly made donations of food, medical care, schools, and other social services to benefit the poor in rural communities to project a populist "Robin Hood" image. Though "officially" disbanded, LFM remained in operation, even after the June 2011 arrest of leader José de Jesús Méndez Vargas (alias "El Chango"), who allegedly took over after Moreno González's disappearance. |95| Though largely fragmented, remaining cells of LFM are still active in trafficking, kidnapping, and extortion in Guerrero and Mexico states, especially the working-class suburbs around Mexico City. |96| Observers reported that LFM had been largely driven out of Michoacán by the Knights Templar. |97| As a DTO, LFM has specialized in methamphetamine production and smuggling, along with other synthetic drugs. It also has been known to traffic marijuana and cocaine and to tax and regulate the production of heroin. In 2013, frustration with the perceived ineffectiveness of Mexican law enforcement in combating predatory criminal groups led to the birth in Michoacán of "autodefensa" or self-defense organizations, particularly in the tierra caliente region in the southwestern part of the state. Composed of citizens from a wide range of backgrounds–farmers, ranchers, businessmen, former DTO operatives, and others–the self-defense militias primarily targeted members of the Knights Templar. |98| Local business owners, who had grown weary of widespread extortion and hyper-violent crime that was ignored by corrupt local and state police, provided seed funding to resource the militias in Michoacán, but authorities cautioned that some of the self-defense groups had extended their search for resources and weapons to competing crime syndicates, such as the Cartel Jalisco New Generation (Cartel Jalisco Nueva Generación [CJNG]). Despite some analysts' contention that ties to rival criminal groups are highly likely, other observers are careful not to condemn the entire self-defense movement. These analysts acknowledge some gains in the effort to combat the Knights Templar that had not been made by government security forces, although conflict between self-defense groups also has led to violent battles. The Mexican government and self-defense forces delivered heavy blows to the Knights Templar, especially with the confirmed killing in March 2014 of Nazario Moreno Gonzalez, who led the Knights, and the killing of Enrique Plancarte, another top leader, several weeks later. |104| Previously, the self-defense forces and the Knights Templar reportedly had split Michoacán roughly into two, although other criminal organizations continued to operate successfully in the area. In late February 2015, the Knights Templar DTO leader Servando "La Tuta" Gomez was captured. The former schoolteacher had taken risks by being interviewed in the media. With La Tuta's arrest, the fortunes of the Knights Templar plummeted. But new spinoff groups filled the void, including the rise of such groups as Los Viagras, and they contested the state with the Cartel Jalisco (see "Cartel Jalisco-New Generation (CJNG)," below). In March 2017, the alleged leader of Los Viagras, Jose Carlos Sierra Santana, was killed. The Mexican government quickly reinforced troops and federal police forces in the state to prevent a bloodbath as cartels struggled to assert new patterns of dominance. Contrary to the experience in Colombia in the 1980s and 1990s with the sequential dismantling of the enormous Medellin and Cali cartels, fragmentation in Mexico has been associated with resurging violence. |124| A "kingpin strategy" implemented by the Mexican government has incapacitated numerous top- and mid-level leaders in all the major DTOs, either through arrests or deaths in arrest efforts. However, this strategy with political decentralization contributed to violent succession struggles, shifting alliances among the DTOs, a proliferation of new gangs and small DTOs, and the replacement of existing leaders and criminal groups by even more violent ones. |125| Analysts disagree about the extent of this fragmentation and its importance. Some believe diversification may be evidence of organizational vitality and growth. Others contend that diversification signals that U.S. and Mexican drug enforcement measures are cutting into profits from drug trafficking or constitutes a response to shifting U.S. drug consumption patterns and policies, such as legalization of marijuana in some states. |128| The growing public condemnation of the DTOs also may be stimulated by the organizations' diversification into street crime, which causes more harm to average Mexican civilians than intra- and inter-DTO violence related to conflicts over drug trafficking. Because the DTOs have diversified, many analysts now refer to them as transnational criminal organizations (TCOs), organized crime groups, or mafias. |129| Others maintain that much of their nondrug criminal activity is in service of the central drug trafficking business. Notes: Information provided by Eduardo Guerrero-Gutierrez to CRS on July 14, 2015. Spanish names used in this table are translated as Jalisco-Nueva Generacion = Jalisco Cartel-New Generation; Golfo = Gulf; Los Caballeros Templarios = Knights Templar. Despite arrests of significant Sinaloa leaders, the organization seems to have fared the best of the major DTOs that have been targeted by the government's kingpin strategy over the years; it has endured and sustained a dominant position since the administration of Felipe Calderón. Some observers question if the return of a predominant power–or hegemon–among the DTOs could bring about a permanently lowered state of violence, what some analysts call a pax mafiosa. Such an accommodation, however, would come at the price of the loss of state legitimacy. The continual flux and fluidity of the DTOs suggests that Sinaloa's leaders face a criminal environment in the post-El Chapo-era in which El Chapo's sons appear to be competing for control with the cartel's aging leaders, such as "El Mayo" Zambada Garcia, and reportedly with a new rival, El Chapo's colleague Dámaso López Núñez. The rapid rise of the rival CJNG organization and its ambitious expansion in 2015 and 2016 has led to very high levels of violence, particularly in Ciudad Juarez and Tijuana, where the CJNG has clashed with Sinaloa over control of the lucrative heroin trade and smuggling routes that Sinaloa previously dominated. June S. Beittel is an Analyst in Latin American Affairs. This document has been published on 03Jul17 by the Equipo Nizkor and Derechos Human Rights. In accordance with Title 17 U.S.C. Section 107, this material is distributed without profit to those who have expressed a prior interest in receiving the included information for research and educational purposes.